NYAMA 2019 Sponsorship Opportunities are now available! Support NYAMA in 2019 by becoming a sponsor of one of our signature events! 2018 Fall Conference: More than 135 guests enjoyed NYAMA’s annual Fall Conference in the breathtaking 1000 Islands region of New York from September 10-12, 2018 highlighted by a moving tribute to the heroes of 9/11, and a spectacular evening at historic Boldt Castle followed the next morning by a tour of Fort Drum. Additional special events included a golf outing at 1000 Islands Country Club and a boat trip to the Rock Island Lighthouse and Coyote Moon Vineyards for a wine tasting. The 2018 conference was hosted by Watertown International Airport. “As the host of the Fall Conference, we are thrilled so many folks had a great time and enjoyed the conference program and the local area,” said Grant Sussey, NYAMA Vice President and Airport Manager of Watertown International Airport. The annual conference is the premier aviation industry event for New York’s aviation professionals, bringing together representatives from airports throughout the state, and the businesses and communities that rely on them. Port Authority of NY & NJ Assistant Director of Aviation Security and Technology and AAAE Chair Jeanne Olivier delivered the keynote presentation, paying tribute to the heroes of 9/11 as she spoke humbly of her own experiences during the terrorist attacks when the Port Authority was headquartered at the World Trade Center, and the aftermath. 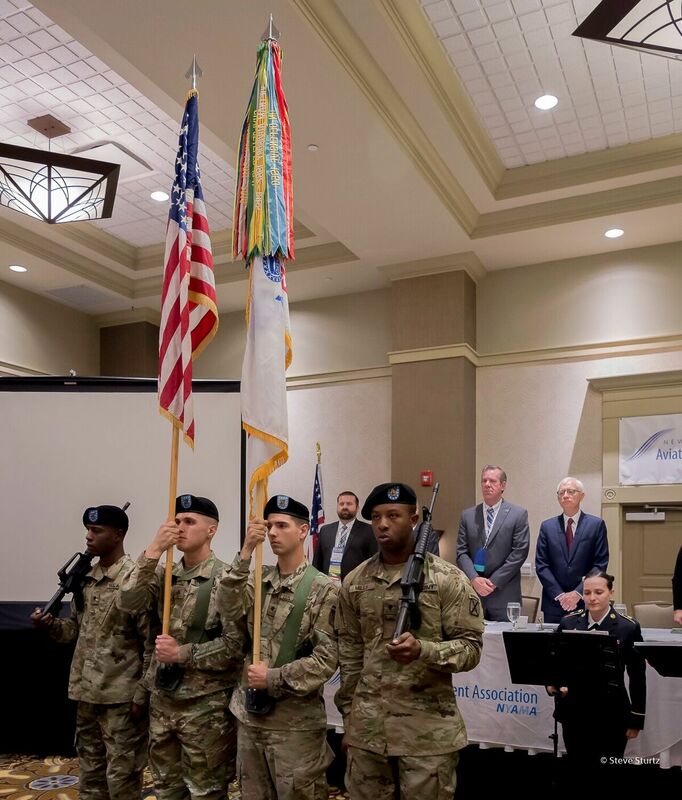 Click here for scenes from the 2018 Fall Conference. Save the date for the 2019 Fall Conference in Syracuse, NY on 9/9 - 9/11/2019! 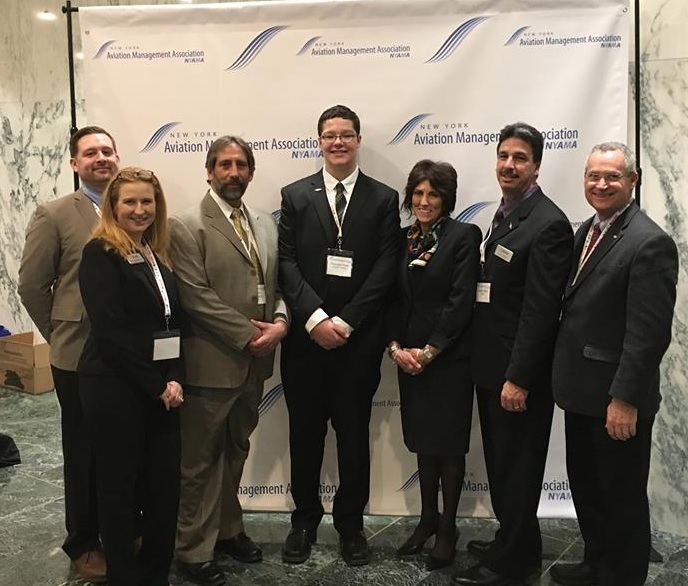 The New York Aviation Management Association's annual Aviation Advocacy Day is held in Albany each year to provide airport managers, corporate representatives, educators and other aviation officials dedicated to airport development with the opportunity to meet with their legislators. This event provides a forum for constructive dialogue between colleagues and state lawmakers. Our Advocacy Day program begins with a briefing, in which attendees receive timely information on state budget issues and state-funded airport development programs, followed by a Legislative Reception at the Legislative Office Building. The next day, aviation representatives attend strategic meetings throughout the morning and early afternoon to educate lawmakers on the importance of the aviation industry. All NYAMA members and aviation officials are welcome and encouraged to attend! Click here to read how NYAMA called for increased state funding at its 2019 Annual Advocacy Day.